Do ya wanna be a legend in the ring, or a bum on the ropes? To be the best boxer in Philly, ya gotta be hungry! Ya gotta train by running up flights of stairs and practicing your punches on whole sides of beef. And once you think you're ready to eat lightning and crap thunder, ya gotta train s'more! In all honesty, we could never be as good of a boxing trainer as Mickey was for Rocky, since we don't have that same aggressive attitude, and we don't sound like we just ate a box of cigars when we talk. 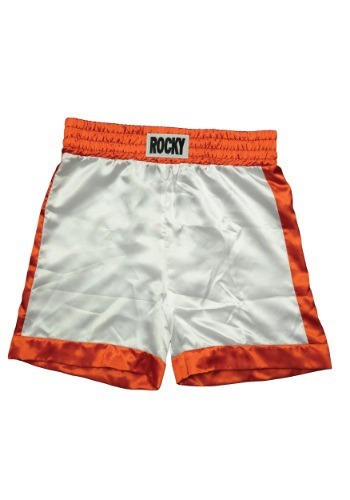 But we are good enough to know you can wear these snazzy Rocky Balboa Boxing Trunks to look like a real heavyweight champion! These licensed satin shorts look just like the ones Rocky sports in the movies. Wear them with some boxing gloves and a robe for a winning costume, but if you want that championship belt, ya gotta earn it in the ring, punk!